Join or renew your membership online! Secure site provided by the History Store at the Ohio History Connection. The 2019 Membership Invoice can be printed and mailed with payment to Mark Bloom at the address listed on the letter. The membership brochure may be printed or completed electronically and emailed to Mark Bloom at mabloom@uakron.edu. 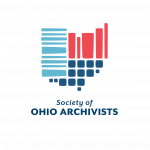 Check or money order should be made out to Society of Ohio Archivists and mailed to: Mark Bloom, Treasurer, 8477 Summer Rd., Macedonia, OH 44056.